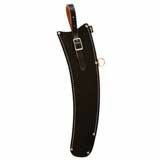 4" Belting Pole Saw Scabbard w/ Socket Strap. This scabbard has an integrated strap that is used to lock you scabbard to you pole saw by attaching to the hook portion of you socket. Constructed of a durable belting material (belting material is product developed and used for heavy duty conveyor belts. Fits 17" blades like the FI17SB.